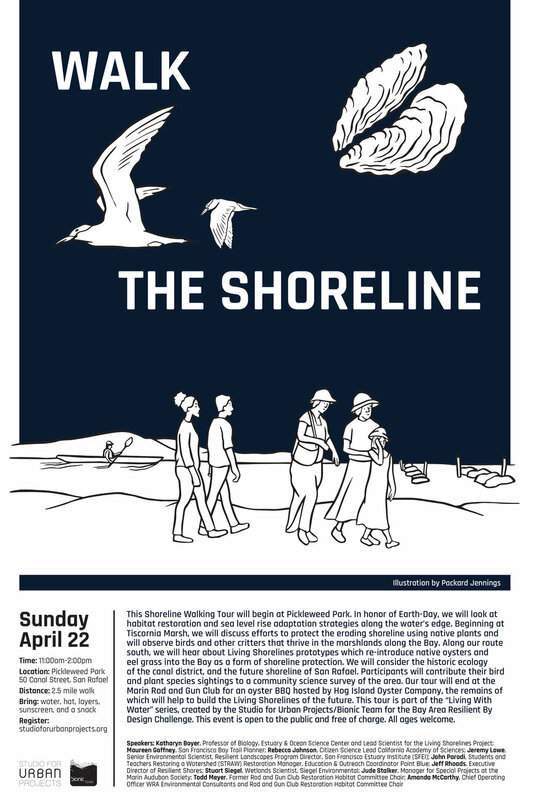 Come to join us this Shoreline Walking Tour begins at Pickleweed Park. In honor of Earth-Day, we will look at habitat restoration and sea level rise adaptation strategies along the water’s edge. Beginning at Tiscornia Marsh, we will discuss efforts to protect the eroding shoreline using native plants and will observe birds and other critters that thrive in the marshlands along the Bay. Along our route south, we will hear about Living Shorelines prototypes which re-introduce native oysters and eel grass into the Bay as a form of shoreline protection. We will consider the historic ecology of the canal district, and the future shoreline of San Rafael. Participants will contribute their bird and plant species sightings to a community science survey of the area. Our tour will end at the Marin Rod and Gun Club for an oyster BBQ hosted by Hog Island Oyster Company, the remains of which will help to build the Living Shorelines of the future. This tour is part of the “Living With Water” series, created by the Studio for Urban Projects/Bionic Team for the Resilient By Design Bay Area Challenge. This event is open to the public and free of charge. All ages welcome!